Last week Steve was awarded a John and Rebecca Moore’s endowed chair at the University of Houston, starting in the 2013-2014 academic year. In addition to being an honor, this will give him a small fund of money to use on job-related activities. 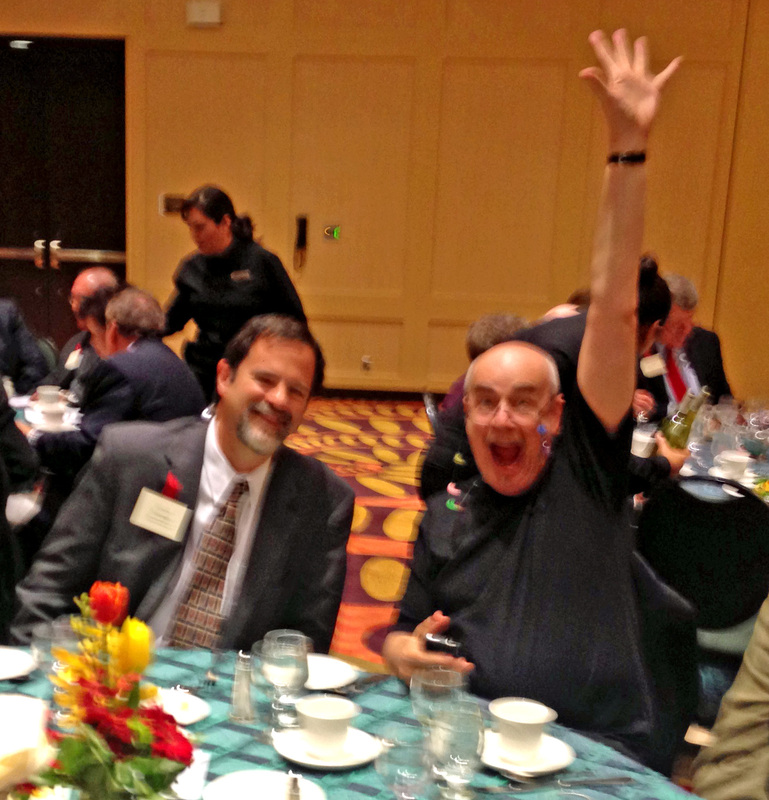 Here we see a candid moment with Dan Graur and Steve celebrating at the dinner. Congratulations to Hongyu Guo and coauthors, whose paper on how climate mediates interactions between mangroves and salt marsh vegetation has just been published online in Global Change Biology. Guo, H., Y. Zhang, Z. Lan and S. C. Pennings. 2013. Biotic interactions mediate the expansion of black mangrove (Avicennia germinans) into salt marshes under climate change. Global Change Biology. DOI: 10.1111/gcb.12221. Mangroves (black mangrove Avicennia germinans) are currently expanding their range on the Texas Coast, likely due to warmer winters, and projections from climate models suggest that much of the Gulf Coast could switch from salt marsh to mangrove over the coming century. Hongyu’s paper helps us understand the mechanisms underlying this expansion. UPDATE (8/7/2013): This paper is now available with full citation information. GCB 19, 2765–2774. Welcome to the Pennings lab blog. We’ll use this site to communicate important news from the Pennings lab community (present and past members). Congratulations to Chuan-Kai Ho on his new paper in PLOS ONE. This (finally) wraps up the publication of his PhD research. Ho, C.-K. and S. C. Pennings. 2013. Preference and performance in plant-herbivore interactions across latitude—a study in U.S. Atlantic salt marshes. PLOS One. doi: 10.1371/journal.pone.0059829.